The Fabyan Villa Museum was the home of George and Nelle Fabyan from 1905 - 1939. It was initially their summer home, but shortly after 1907, when they hired Frank Lloyd Wright to enlarge and re-model their home, they decided to make it their permanent residence. Over the next 20 years, their estate grew into a lavish showplace, complete with fountains, swimming pools, gardens, a windmill, private zoo, tennis courts, and more. 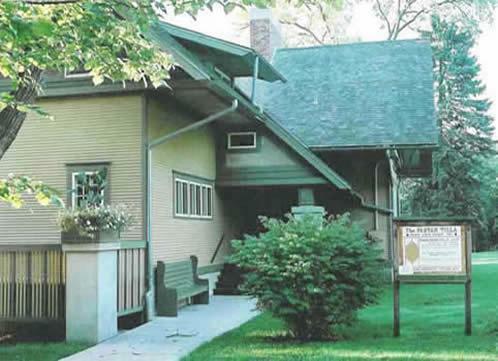 A visit to the Villa Museum gives visitors an experience of Frank Lloyd Wright architecture, as well as an overview of the unique and fascinating Fabyan story. The Museum contains the Fabyans' collection of Asian artifacts, natural history specimens, Nelle's original Mission-Style bedroom furniture and some surprises! You will also learn of the Fabyans' contributions to society, country and science, and the generosity they bestowed on residents of the Fox Valley Area. Their Japanese Garden, first installed c. 1909, is still a tranquil oasis where history melds with nature and theory. This special site affords you the opportunity to simply enjoy a bit of harmony with nature, or to learn principles of Japanese gardening. The major part of the Fabyan Estate is now the Fabyan Forest Preserve, part of Kane County Forest Preserve District in Illinois. The Villa is on the National Register of Historic Places.